The Ireland team lost, over the last while, a bit of what made it special, lost its way somewhat. What Mick McCarthy has to do is bring that back, starting with the next two games, against Gibraltar tomorrow and Georgia next week. And he has started off in the right way. I think it's the way that Mick treats players which makes him successful. He demands that you put in your utmost effort, you do your best. But when you do that, he rewards you, he is someone you want to go out and play for. If he can instill that in the team, where they are confident going out, they know they go out on that field with a pat on the back, then he can get more from the team. He will try and create a better spirit in the camp as that's what he is good at. From when I played for Mick - and he gave me my Ireland debut when I was 20 - to what I hear is the attitude now, it's the same: make Ireland hard to beat again, make them a side where other teams fear coming to Dublin, where the Irish team don't take a step back but are on the front foot, where they are in a match to win it and not just take part. Over the last while, we have worried too much about other teams, what they think of us, what they can do to us. I think we lost track of what we were doing as a team and if Mick gets that back, that mindset where the players say ‘We are Ireland, if we need to be ugly and tough to beat, then so be it'. Mick won't let the Irish team be just a carpet for other teams to walk over, we need to go and play them and not let them play around us. The Gibraltar game should look after itself but Georgia on Tuesday will be key, as they are a side who have caused Ireland so many problems. We have given Georgia too much time and space over the years and we need to be at them, chasing them, hunting them down. If the manager tells the team to sit off and drop back it gives the opposition those valuable few seconds to get on the ball and start moving it around, but if we press them - what they used to call 'Put Them Under Pressure' - straight away, they have to start going long as we're not giving them a chance at the back. If the players have that freedom from the manager, the trust you need, to go at a team, that comes from the manager. 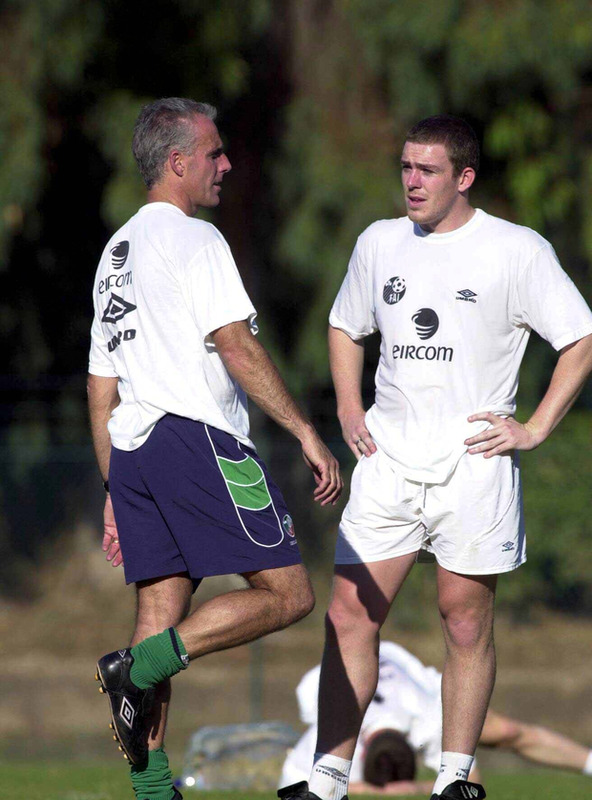 I was 17 when I was first in the squad under Mick, but I had to wait a few years for my first cap. I was a bit intimidated when I met Mick for the first time as he's an imposing figure, a big character, so meeting him as a 17-year-old and being around these superstars was a big thing for me. But Mick gave you confidence as a young player. He would tell you, even when you were first in the squad, that you weren't there for a holiday, you were in the squad as he thought you were good enough and people like me had to prove it to him. He always gave you that confidence. I remember my second competitive game for Mick, Portugal away in 2000. I hadn't trained well all week, I don't know why but my game was off. Mick just came up to me and said 'some people can train badly and play well: you are not one of those so make sure you are on your game tomorrow night'. As a player you can get lazy and think 'I can play here no bother' but Mick just demanded the best from you every time. He was a huge influence on me. At the start of the World Cup qualifiers, in 2000, I'd been suspended for the first four club games of the season so I'd not played before Mick put me in for the qualifier away to Holland. He rang me before the match to say 'I know you've missed games but I have faith in you, so make sure you are sharp and don't let me down', and we got a very good draw in Holland. That phone call gave me the belief I could play. We drew in Holland and Portugal and went on to qualify for the World Cup, as Mick had given every player in that squad the belief that he could play and do well. I never had a doubt. Mick didn't say to us 'Oh, this is tricky, we're in Amsterdam or Lisbon and up against it so we need to sit back'. We went out to compete, let the other team know they are in a game. We had the players to do that, though Mick had a different type of squad now. But the whole camp seems to be more relaxed, happier, it looks like there is goodwill towards them and they feed off that. I'm not having a go at what happened before, as the team got to the Euros just three years ago, but by the end under the last manager, the players looked stressed. They looked as if they were not enjoying themselves. Mick can get that back again.